This fun pop culture spoof design reads "Birda's Paradise." 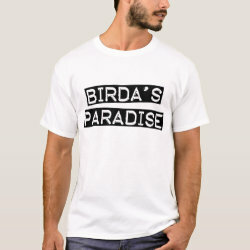 Your paradise is probably not the same as a gangsta's, but that's no good reason not to grab this awesome birder swag. The text here is done in the style of label tape.